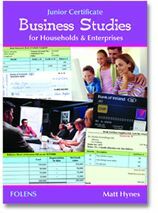 This book covers the Junior Certificate Business Studies syllabus at both Higher and Ordinary Level. • It takes the most up-to-date changes in the examination into account. • Provides a wealth of fully worked-out exercises within each chapter. • It has a useful glossary of key terms at the end of each chapter with easy to read tables that follow the exam format.